Emerald ash borer (EAB), a destructive insect from Asia that attacks and kills ash trees, has significantly expanded its range in the First State, according to state plant health officials. In November of 2018, additional detections of emerald ash borer were confirmed near Newark and Glasgow in New Castle County. This follows its confirmed presence at two other sites in Delaware: one near Middletown, New Castle County, and another near Seaford, Sussex County. What is emerald ash borer (EAB)? The emerald ash borer is a small, green beetle that belongs to a large family of beetles known as the buprestids, or metallic wood boring beetles. Emerald ash borers can travel to new areas by natural means, as well as on firewood, timber and nursery stock. The emerald ash borer feeds under ash tree bark during its larval stage, which damages and eventually kills the trees. Adult EABs emerge and the spring and mate shortly thereafter, with each female laying 60 to 90 eggs in a lifetime. In the spring, pupae transform into adults and emerge through “D”-shaped exit holes. 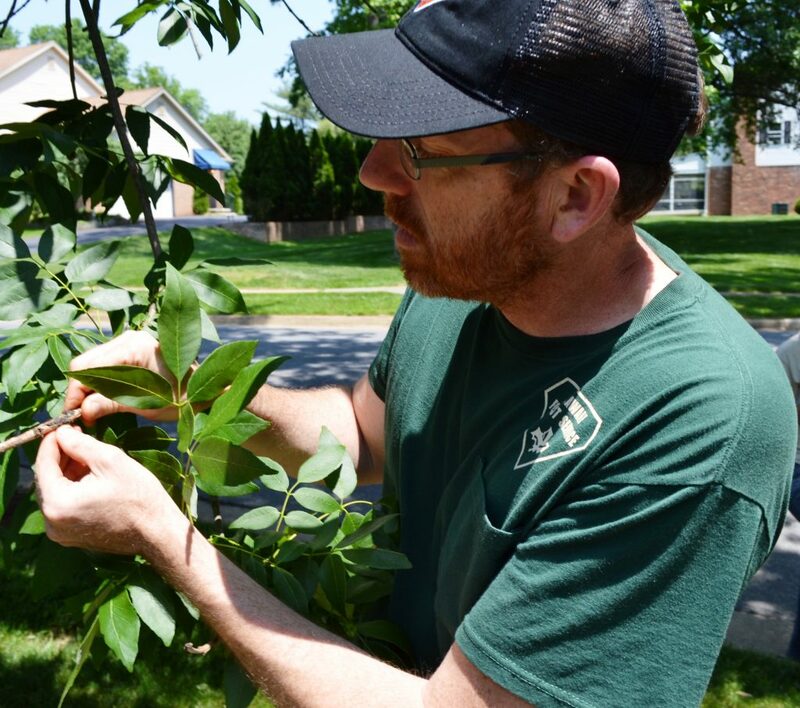 Symptoms of an EAB infestation may not be apparent immediately, with damage taking up to three years to be visibly detectable. Symptoms can include branch dieback in the upper crown, vertical bark splits, and small shoots (epicormic branching) on the trunk, as well as woodpecker damage. Native to Asia, EAB was unknown in North America until its discovery in southeast Michigan in 2002. Since then, EAB has killed millions of ash trees, with numbers rising every year. The potential for damage is very high. A previous study by the U.S. Forest Service once estimated that the ongoing EAB infestation could have an estimated cost of $10.7 billion nationally. In Delaware, ash trees are relatively minor components of the native forest, found mainly in streamside areas and flood plains. In some urban areas, ash is the predominant large street tree. I’m a homeowner. What do I need to do? Find out if you have ash on your property and monitor trees for signs of poor health or damage. Consult a certified arborist for an evaluation and treatment options. Don’t plant ash if you are considering a new tree for your property. Instead, check out the Delaware Forest Service Recommended Trees list, below, for suggestions on finding the right tree for the right place. How do I tell if my trees are ash? Identification of the bark and leaves of an ash tree. My ash tree looks fine. Should I start treating my tree? We encourage homeowners to consult a certified arborist for a tree health inspection; visit www.isa-arbor.com to search for ones near you. Trees that look fine or do not have EAB may have other health issues. My ash tree looks sick. How should I treat my tree? Trees already infested with EAB are treatable if the damage is not severe. Trees with more than 50 percent canopy loss will likely not recover. In some communities, removing infested trees may be mandatory. We encourage homeowners to consult with a certified arborist for a tree health inspection; visit www.isa-arbor.com to search for ones near you. A certified arborist can help you determine the best treatment option. What are good alternatives to planting ash trees? Many broadleaf trees are available as replacement for ash. Check out the Delaware Forest Service’s recommended trees list for details. What trees should I not plant? Trees that are not recommended because they are known to develop serious issues with pests or diseases include ash; northern red oak; pin oak; leyland cypress; hemlock; Japanese black pine; Austrian pine; any white-barked birch; American elm. Trees that should not be planted because they are invasive and can displace native vegetation include Norway maple; tree of heaven (ailanthus); paulownia; mimosa; white mulberry; Bradford pear; and Chinese elm. What other actions are being taken? Delaware is already included in a federal quarantine with 35 other states and Washington, D.C. that restricts the interstate shipment of all ash wood and wood products – ash nursery stock, green lumber, waste, compost and chips – as well as hardwood firewood of all species. Some shipment out of state may be permitted if certain requirements are met and a federal permit is issued. Why is it important not to move firewood? Firewood is a prime avenue for emerald ash borer to travel between states. Get more details at Don’t Move Firewood. 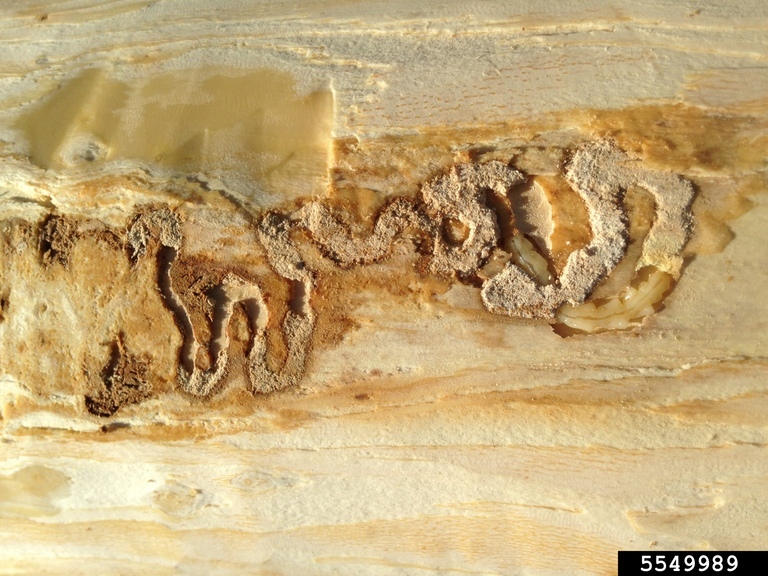 How can I report a suspected emerald ash borer case or ask further questions? Call the Delaware Department of Agriculture at 302-698-4500 and ask for either the Plant Industries Section or the Delaware Forest Service. What has Delaware been doing to guard against EAB? Delaware has been working to monitor for emerald ash borer infestations since 2004, using both visual surveys and baited traps that attract the insects. Grant funding from the U.S. Department of Agriculture has supported both monitoring and forest pest outreach efforts. DDA staff members have worked to educate civic associations, municipalities, forest health professionals, and land managers about the importance of planning and how to look for and report suspicious pests. Delaware Forest Service forest health specialist Bill Seybold inspects an ash tree in North Wilmington. Watch Delaware Department of Agriculture staff conduct surveillance for emerald ash borer during the 2015 monitoring season. Print out and save this Delaware fact sheet on EAB.